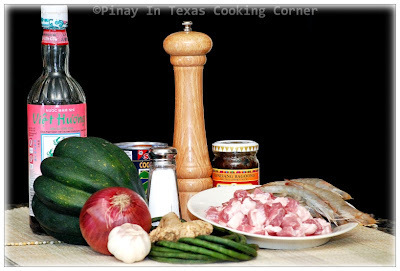 Ginataan is a Filipino term which refers to food cooked with gata, which is the Filipino word for coconut milk. You can cook anything with gata: beef, pork, poultry, seafood, vegetables, and fruits...so in the Philippines, ginataan is a name shared by various desserts and viands. Here’s a very simple but delectable vegetable dish cook with coconut milk. 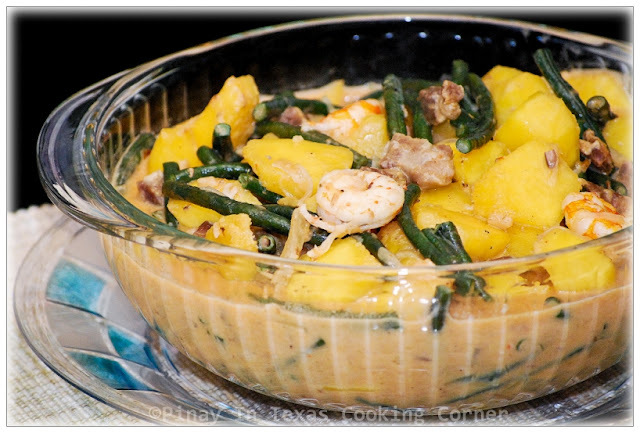 It is called Ginataang Kalabasa at Sitaw (Squash & String Beans in Coconut Milk). It is my favorite Filipino vegetable dish. Some cook this as ginataang kalabasa or ginataang sitaw alone. I prefer cooking them together because I love the healthy combination of kalabasa & sitaw as well as the very appealing color of these vegetables when cooked together. 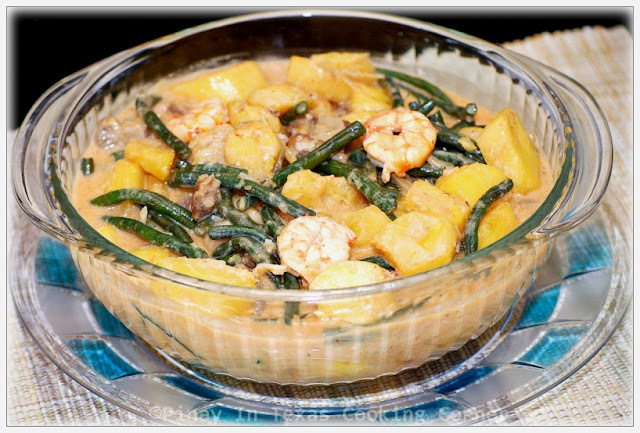 Ginataang Kalabasa at Sitaw is a healthy dish and is a real crowd pleaser! See for yourself! 1. In a wok or large saucepan over low heat, cook pork with a little salt (no water) while stirring frequently until it renders fat and the meat is light brown. Push the cooked meat to one side of the pan and sauté the garlic using pork fat until light brown. 2. Add ginger and onion. Saute until onion is translucent. 3. Add the squash and shrimp paste. Saute for 2 minutes then add in the coconut milk. Bring to boil. Make sure to stir this occasionally to avoid curdling. Simmer until squash is half cooked, that is about 5 minutes. 4. Add the string beans and fish sauce. Simmer until string beans are almost cooked, then add the shrimps. Add salt & pepper to suit your taste. Simmer for another minute or two. Note: Some add in the shrimps before adding the veggies. I prefer doing it last because I don’t like overcooked shrimps. Shrimps when overcooked will shrink and shrivel and will be all tough and stringy. If you want to have it sautéed, you can do it, but be sure to remove it from the pan as soon as it starts to curl up and turns pink on both sides. Set aside on a plate and just add it when all veggies are cooked. thank you Ms Tina... I have just finished cooking ginataang kalabasa, my few first cooking adventure. I browsed the net to read on how to do it correctly and saw your recipe. There are few ingredients, I missed to include: onion,ginger,shrimp paste and fish sauce. Well then, It will be complete next time. My pleasure, Therese! It's feels so good to be able to inspire others!